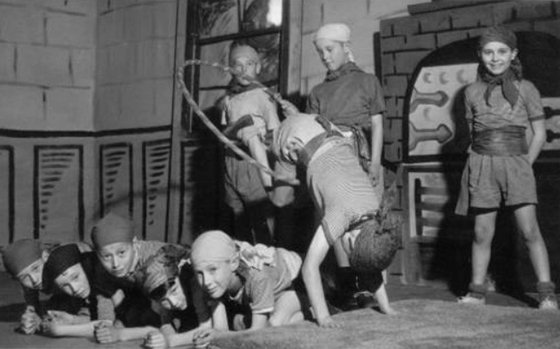 Is your blog optimized for lead generation or are you making visitors jump through hoops? Image source. Does your blog work for your business? Or would you like to generate a few more leads? Blogging to generate leads is hard work. Success doesn’t happen overnight and sneaky doubts creep up on us all. Are we on the right track? Are we maximizing opportunities to win business? Here’s a checklist to help you optimize your blog content, drive more traffic to your site and generate more leads. Let’s start by reviewing your content strategy. Your objective may be to increase traffic, generate leads or to raise your profile as an authority. But if you use your blog just to spread your sales messages, you may struggle to find readers and customers. And your blog may remain a whispering voice, lonely and forgotten. If you only use your blog to spread your sales messages, you may struggle to find readers. Most people aren’t interested in your sales messages. Most people aren’t even interested in your business. They want to know what’s in it for them. Readers like to share content that’s helpful and practical rather than promotional. As Jonah Berger describes in his book Contagious, practicality can trigger content to go viral. To gain more business with your blog, you should stop thinking like a salesman and start acting like your reader’s mentor. Be insanely helpful. Know your ideal customer. Create a short profile of a buyer persona or avatar. When you think about blog topics for the next month, visualize your reader and how you can help her achieve her goals. When you visualize one reader, you’ll find it much easier to generate useful blog topics and write engaging content. Answer your readers’ questions because it builds trust and authority. Plus you’ll gain more traffic when people search online for answers to their questions. For instance, when a reader asked me why my writing feels so conversational, I wrote a blog post to answer her question. This post now drives visitors to my site who also want to know how to write conversationally. Include quotes from authorities in your field, because it shows you’re well connected. If the people you’ve quoted help promote your post, it can also boost your social media shares. Create in-depth articles that are insanely useful because both readers and Google love them. Offer as much value as possible. Write for your audience first and optimize for Google later. When you write solely to please Google, you silence your unique voice and slaughter your creativity. Add a splash of personality to engage your audience. Create landing pages that provide introductions to a specific topic with links to posts that go into more detail. 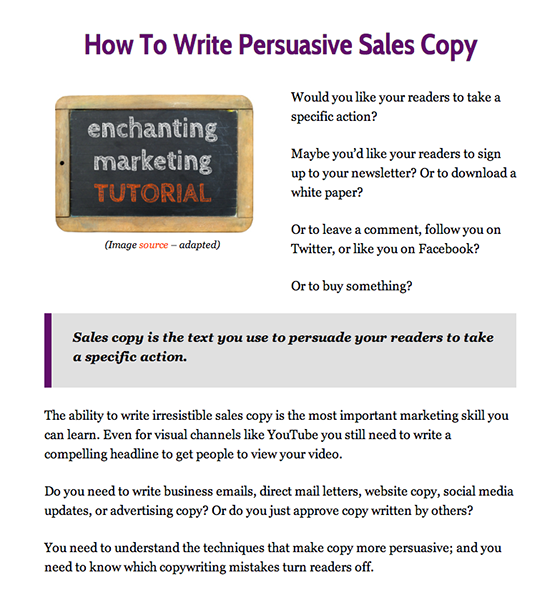 Check out this example of a landing page about how to write persuasive sales copy. 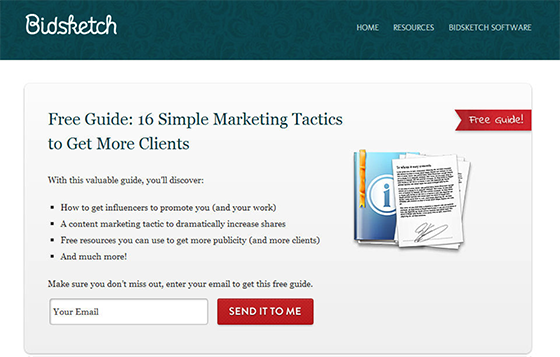 This page is prominently featured in my sidebar as a “free tutorial” driving traffic and engagement with readers. This page also receives more search traffic than any other page on my site. What topics do you want to be known for? This landing page about creating persuasive sales copy delivers added value to readers and drives traffic. Create a “New? 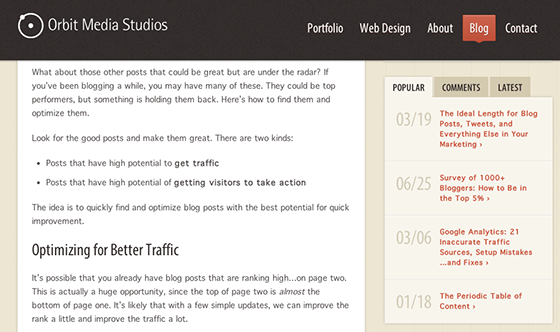 Start here” page to showcase your most helpful content to new visitors. 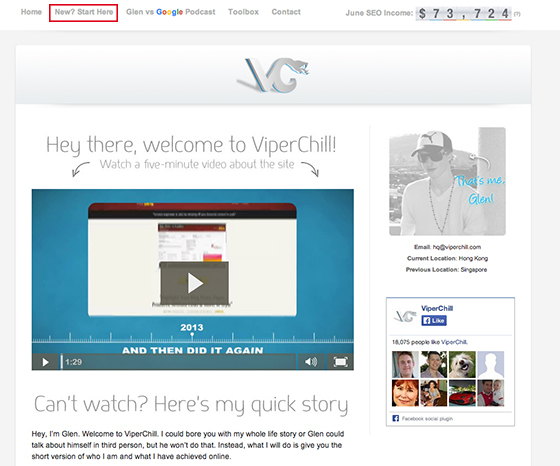 ViperChill has a “New? Start here” page showing resources for beginner, intermediate and advanced marketers plus a little background about the site owner’s journey as an online marketer. Use images that add value. Boring stock photographs undermine your brand. You don’t want to come across as cliché, do you? Here’s a great lists of design resources for marketers. Don’t think of your blog as a sales tool. It’s simply a way to start a conversation with potential customers. When you stop selling on your blog and start helping, you’ll find that you sell more. You’ve written content your prospects love to read and share. You answer their questions. You help them make decisions. You show them the way. But do you make reading your blog posts effortless? Or is your blog design turning them away in disgust? Follow these six tips to give readers the feeling they glide effortlessly through your content. Choose an easy-to-read font for your paragraph texts. Fancy fonts may stand out, but they are difficult to read. Use ornamental fonts like script writing only for your subheadings. Increase your font size. The recommended size depends on the x-height of your font. This is the height of letters like o, e, n, m or x. Different font types may have different x-heights for the same font size. Optimize the width of your blog. The optimal line length is between 50 and 75 characters. Lines that are longer make it hard to focus on your text; and shorter lines make your reader feel stressed as he has to jump back to the beginning of a line too often. Choose a dark font on a white background, because it’s easier to read. You know that don’t you? Okay, this is an exaggeration – but you get my point. Dense blocks of texts are discouraging readers, so keep your paragraph length to a maximum of six lines. Have large subheadings after every few paragraphs and increase white space around your subheadings to give your blog an airy feel. Introduce bullet points when you sum up more than three items. Bullet points are easy to scan. They interrupt a monotonous flow and increase white space. Check whether the amount of white space feels comfortable before publishing your post. Adjust paragraphs when necessary. The blog of graphic designer and web developer Rafal Tomal is easy to read with lots of white space and a font size of 20px. Make your blog design mobile responsive so it’s comfortable to read on tablets and smartphones, too. Blog readers are fleeting passersby. They look through your shop window, but they might never come back. Turning blog readers into email subscribers allows you to build long-term relationships. Email subscribers will come back again and again, presenting you with an opportunity to sell to them. Consider a two-step opt-in process because it can increase conversions. 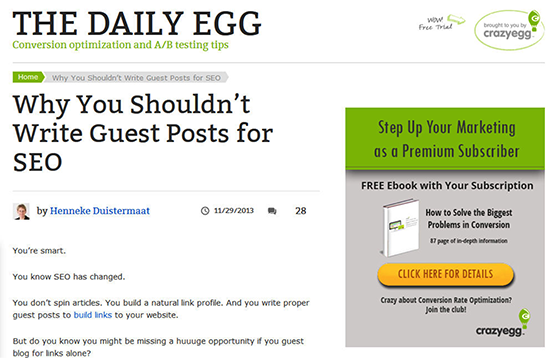 In a two-step conversion, people initially see a “sign up” or “download” button and only see a field for entering their email address after they click it (as in the Crazy Egg example above). Create an “ethical bribe” to entice readers to opt in to your list. Use testimonials to show the value of your report, webinar or e-course (see this example from Michael Aagaard). Even a free report has to be sold ­– you need to persuade people to enter their email address and give up their precious time to read your report. Make your sign-up copy benefits-focused. People don’t want to receive a report. Instead, they want to know how your report helps them become happier, richer or more productive. ConversionXL entices you to sign up by suggesting you can learn 13 ways to increase your conversion rates right now. Test your sign up form with and without privacy statements, because a privacy statement can decrease sign-ups. Consider an autoresponder series so new readers can get to know you and your offer. Don’t expect everyone to find your best blog posts themselves ­– instead, point them in the right direction. Your autoresponder is also a good opportunity to offer a free trial of your service, if appropriate. Use a “popular posts” section to showcase your best converting blog posts. Orbit Media Studios showcases popular posts in their sidebar. Remove distractions such as an RSS icon, because an email subscriber is much more valuable than an RSS subscriber. HubSpot features bonus material relevant to a post. 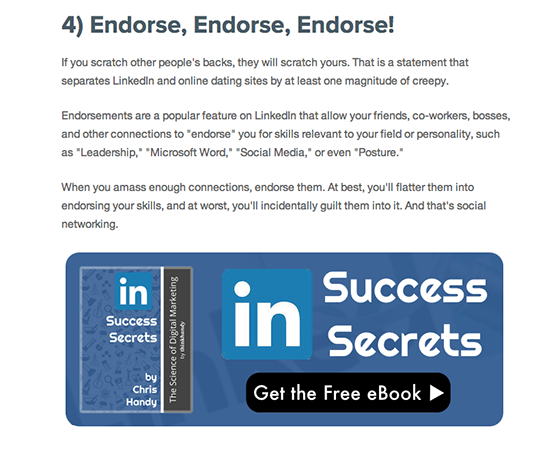 On a post about improving your LinkedIn performance, for instance, they feature an ebook with LinkedIn Success Secrets. 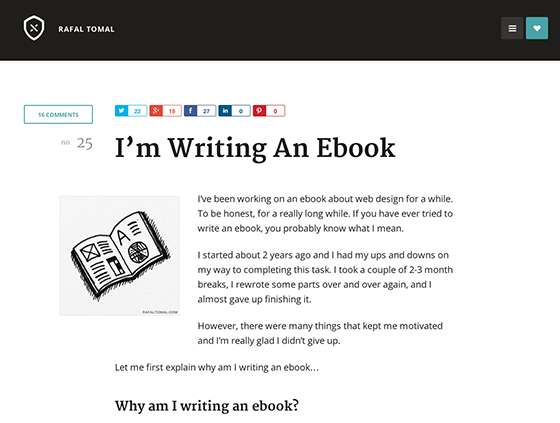 You’re writing engaging blog posts. You’re enticing blog readers to join your list. But how can you increase the reach of your blog? Polish and edit your headlines, because the right headline can massively boost traffic to your site. Don’t forget to arouse curiosity by mentioning a specific benefit. Attract attention by using numbers or power words (such as “seductive” or “stinky”) in your headlines. Emotional, sensory and unusual words attract more attention than standard phrases. Consider testing your headlines on Twitter or use a plugin like Headlines by KingSumo. Include your key phrase in the first 55 characters of headline because longer titles get truncated. This title preview tool allows you to preview where your title will get truncated in Google’s search results. Write meta-descriptions that entice readers to click through. The meta-description is the snippet of information that describes your blog post and that shows up in search results. Think about these descriptions as a call to action – a call to reading your post. Use categories to help human readers and crawling robots find your content. Tags are often not necessary. Find blog posts that are ranked high on page two and boost their ranking with a little tweaking. Andy Crestodina explains how here. Make sure your images don’t slow down your site and optimize file names, descriptions and alt tags. Choose the perfect image size for your favorite social media channel. This Ultimate Guide to Using Images in Social Media includes image sizing guidelines for all your favorite social media channels. Include social sharing buttons to boost social traffic, but consider limiting your buttons to three networks. In one study, Neil Patel received more social shares by promoting three networks rather than five. 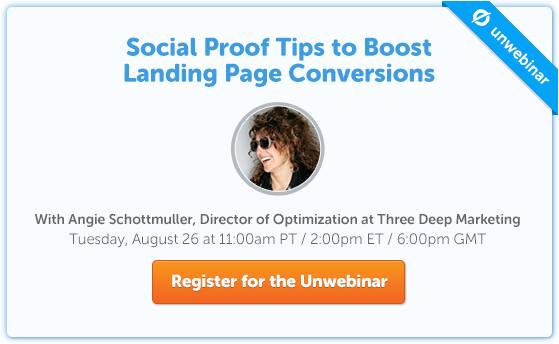 Remove negative social proof. If your blog is new and you don’t get many shares yet, use a plugin like Jetpack that allows you to show social sharing buttons without counts. Don’t tell people your blog is a ghost town. Learn how to jumpstart lead generation on your blog with this awesome checklist. To win business with your blog, it’s not enough to write epic content. You need insanely helpful content and a sound strategy to drive readers to your blog and then to convert those readers into customers. Build an engaged social media following. Network with influencers. Write posts for other blogs in your field. Tweak your content for SEO. But whatever you do, don’t forget to woo your readers. Seduce them. Sweep them off their feet. Because that’s how you win business.